The European Commission defines food additive as "any substance not normally consumed as a food in itself and not normally used as a characteristic ingredient of food, whether or not it has nutritive value." Food additives have gained growing level of importance over the years owing to the diverse requirements of the food industry, end consumers, and regulatory bodies across the globe. Food additives are basically used for imparting specific desired properties to food products, enhancing food palatability in terms of food appearance & appeal, ensuring food safety through prevention of contamination, and through extended shelf-life of products. The report discusses the drivers, restraints, opportunities, and challenges of the market in detail. In the next five years, the markets for acidulants and hydrocolloids are projected to gain better prospects as the fastest-growing segments, globally. 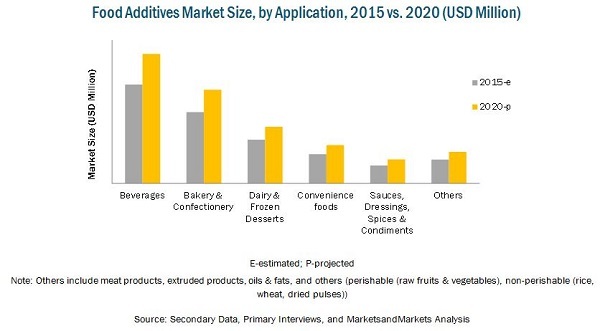 The application of food additives is projected to witness strong demand from bakery & confectionery, beverages, and convenience foods segments. This report estimates the size of the global food additives market in terms of value. The geographical and application-wise split was determined using secondary sources and verified through primary respondents. The demand in different regions was considered while estimating the share of the different regions in the food additives market. The market estimation was also based on various parameters, such as the number of players, demand trends, supply trends, and the extent of research activity in a particular region. The market for food additives is projected to grow at a CAGR of 5.6% to reach USD 52.2 Billion by 2020. The market was dominated by the North American region in 2014, where the U.S. dominated the regional market with ~78% share in 2014. The market in Europe is projected to grow at steady rate while the market in Asia-Pacific is projected to grow at the highest CAGR. This growth may be attributed to the food & beverage sector in Asia-Pacific region, which is greatly influenced by consumer preferences for healthy eating, trend towards natural & organic foods, and the growing demand for convenience food. The trend in the Asia-Pacific region is influenced by the economic growth of countries, growing industrialization, and higher consumer preference for quality products, resulting in ingredient suppliers becoming increasingly optimistic about the future. However, the health hazards associated with the consumption of synthetic additives, growing consumer demand for “no additive” food products or products with natural additives, limited availability & high cost of naturally sourced additives, and the rising consumer shift to organic foods have resulted in restrained market growth since the past few years. Some of the key players in the food additives market include E.I. DuPont (U.S.), Archer Daniels Midland Company (U.S.), Cargill, Incorporated (U.S.), CHR. Hansen Holding A/S (Denmark), Kerry Group Plc (Ireland), and BASF SE (Germany), among others. With the given market data, MarketsandMarkets offers customizations according to the company’s specific needs. The global food additives market is projected to reach a value of USD 52.2 Billion by 2020, at a CAGR of 5.6% from 2015. The market for food additives has a significant impact on the food & beverage industry across the globe. Food additives are broadly categorized based on their type into acidulants, anti-caking agents, colors, emulsifiers, enzymes, flavors, hydrocolloids, and sweeteners. These food additives are further segmented on the basis of source, including natural and synthetic. The global market is also segmented on the basis of application into bakery & confectionery, beverage, convenience foods, dairy & frozen desserts, spices, condiments, and sauces & dressings, among others. The global food safety testing market has been showing dynamic growth over the years, owing to the growing need for different ingredients and multiple functionalities across food applications. Food additives are used in the food & beverage industry to impart specific properties to food products, enhance food palatability, replace fat content, enhance product shelf-life, and protect food from contamination, among others. Furthermore, stringent legislatives and regulations with respect to food safety and public health concerns have meant that food processing industries are keen on getting the right formulation to present the best food product to the consumer, and additives play a pivotal role in this aspect. The main driving force for the growing market is the scope and range of food additives and research associated with it. The figure above depicts the global market size of food additives by region. North America is estimated to account for the majority share in 2015. Europe and Asia-Pacific were estimated to be the second- and third-largest markets, accounting for a combined share of ~53% in 2015. The food additives market constitutes a large number of players, including E.I. DuPont (U.S.), Archer Daniels Midland (U.S.), Cargill, Inc. (U.S.), Chr. Hansen A/S (Denmark), Kerry Group (Ireland), BASF SE (Germany), Evonik Industries AG (Germany), Tate & Lyle PLC (U.K.), Ingredion Incorporated (U.S.), and Novozymes A/S (Denmark). The existing companies in this market are actively involved in introducing new products with diverse functionalities that would provide desirable properties to a wide range of products. Other strategies that are largely adopted by the market players include expansions & investments, acquisitions & strategic alliance, agreements, partnerships, and collaborations & joint ventures, among others.